Can you guess who I’m talking about? ‘They are becoming a strain on public services’, ‘they are guilty of bed- blocking’. Oh and by the way, ‘the church is full of them’! It is true that we are becoming a nation of older people! There are more people aged over 60 now in the UK than there are under 18 years old. Over half a million are over 90! My mother is among them – she was 90 just over a week ago. So have we outgrown our usefulness? Are we just a nuisance? I include myself - as I’m one of the post war baby boomers that our government is so afraid is going to push our country’s resources over the edge. This is very different from Jesus’ day when the average life span was 34. So the fact that there are there are some very old people in the scripture we’ve had read to us is intersting. In fact the whole Advent and Christmas story is about old people whom God expected to prepare for, and be changed by, something very new. At the beginning of the story in Luke are an elderly couple – Zechariah and Elizabeth. They are given the task of bearing a child to herald the coming of Messiah – John the Baptist. Then the Shepherds - they were not children in teatowels, not if it meant being out in the fields overnight. The Wise Men would have been old, otherwise in their culture they would not have been called wise. According to legend, Joseph was old. He certainly seems to have departed this life by the time Jesus is 30. And lastly, at the conclusion of this season of Epiphany, we have our 2 elderly characters for today – Simeon and Anna. So it seems God has not finished with us oldies yet! In fact we are to be “the midwives of the new thing God is doing” 1 , getting alongside the younger generation and enabling the birthing of what God wants to do next. He was “righteous and devout, looking forward to the consolation of Israel, and the Holy Spirit rested on him.” What does that mean? Well I’m sure it didn’t mean (put hands together and look pious!) It did not mean he was so religious he was no earthly good. Simeon, I think, was the sort of man you wanted to be with, to hear talk about the God he prayed to, because his faith was infectious; he made your heart sing. Know some older people like that? And then v 27 Simeon was sensitive to the Spirit. “Guided by the Spirit, Simeon came in to the Temple”. He was so used to saying when he woke up in the morning, “will it be today Lord that I’ll see what you’ve promised?” that he not only went to the Temple that day at the right time, but amongst the crowds of people who would be there, he spotted the ones God had chosen. 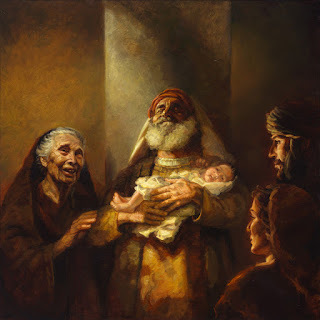 When the parents brought in the child Jesus Simeon recognised him and took him in his arms. What do you think was in his heart as he looked at that Child? Joy, gratitude, “at last”! And humility – in the opening words of his prayer you sense him saying: how could I have been the one to see this promise of the ages fulfilled? I can die happy now! Simeon was also open-hearted to everyone. He didn’t see God’s plan as only for his own nation, the Jews. He saw the responsibility of God’s people to welcome the Gentiles – everyone else in the world; he saw that God loves all nations, all peoples, equally and that his Messiah who we know as Jesus, would open the gates of heaven to all. Lastly, Simeon saw that living generously, open-heartedly like that would bring opposition from those who wanted to keep God for themselves. Those who were the religious elite would not take kindly to having their intensions and pretensions, their petty-mindedness and mean-spiritedness revealed. They would eventually crucify the One who lived like this. And this would mean immense suffering for his mother. Simeon saw it all and did not flinch from saying it as it was. Are we older people like Simeon? - the sort of people others want to be with, to hear talk about the God we pray to? - the sort of people who are sensitive to the voice of the Holy Spirit so we go where he wants, when he wants? - the sort of people who do not flinch at the suffering that comes as a result of following our Crucified Lord? And then there’s Anna. We may not know Simeon’s age but we do know Anna’s. She was exceptionally old for that time in history, 84! She’d been waiting a long time for God’s promise to Israel to be fulfilled. She wasn’t looking backward, she was looking forward to his redemption (v 38). It’s not clear whether, when it says ‘she never left the Temple’, it meant she lived there. Herod’s Temple in Jerusalem was a vast complex – maybe she did have a room there. But she didn’t spend time feeling sorry for herself in her old age. This was one extraordinary woman. She not only prayed, but she fasted. She took prayer very seriously – you have to if you are prepared to fast as well. It’s not easy fasting, especially when you are older, but there are different ways of doing it. I was talking to someone from another church, not in Morecambe, the other day and they are fasting for several weeks so that they can pray in a more concentrated way for their community. It doesn’t mean for them that they abstain from food altogether, but they are eating more simply, and that is helping them listen for what God has called them to do at this time. Another thing about Anna is that she talked to everybody she met about: “this Child”. She had learned while she spent time in the presence of God praying, to articulate her faith. Many of us find that difficult – but as we get older and don’t care quite so much what other people think, perhaps we can spend more time in praying and thinking and reading about what aspects of the message will make sense to the people we know so that we can share it more meaningfully. So let’s believe God has not finished with us oldies yet! We are called with Simeon and Anna to be ready, waiting, available, open to being the midwives of the new thing God is doing, enabling the birthing of what God wants to do next.